Hephesto's Forge: .....the Saints are coming! Finally managed to finish another mini, though to be more precise it's an objective marker for my small IG (Inquisition-themed) force. She started of her life as a Sacred Blade miniature, this old company had a ton of larger scale minis that have really survived the test of time. 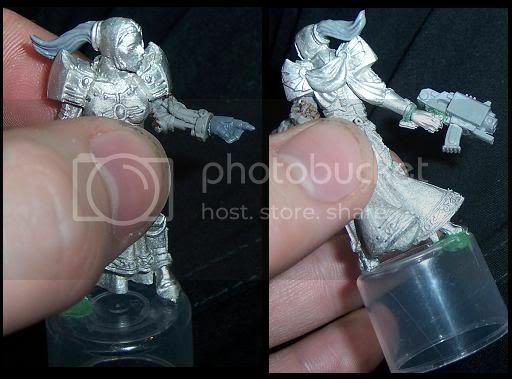 I've been wanting to do something with here for ages, so when I found her in my bitsbox again last week and accidently messed up her swordarm I went searching for a 40K replacement. 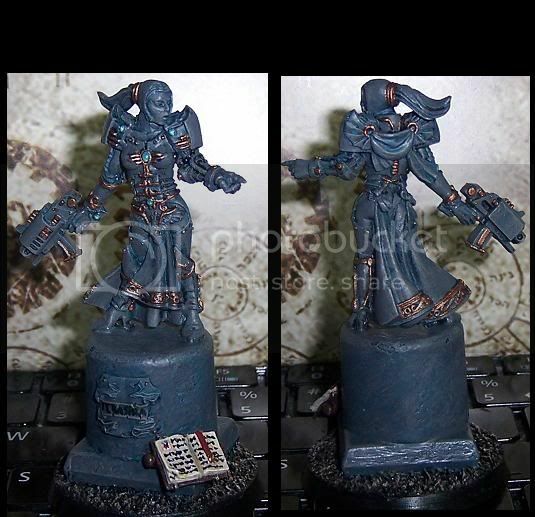 Once that storm bolter came into sight I was sold on the idea of statue of an Imperial Saint (St. Basilla to be precise). The book and ornate, yet fading sign both just seem to happen. 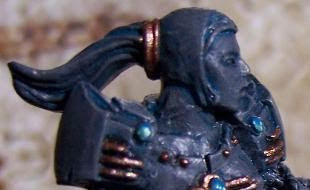 Her bionic left arm took a bit more planning though, particularly as her original arm, cool as it may have been, did not fit with 40K at all (a fane has that effect it would seem). The bionics came from a resin bits kit from Maxmini, which has really paid out for me so far. Painting wise there really isn't anything that spectacular going on I'm afraid, but I'm still rather happy with how she's turned out. Even a bit too pleased it may seem, my other objective markers will definitely be needing some more work to bring them to the same level. Sweet objective marker. Didn't take much to "40K-ify" her. Paint job is simple and effective - your book text looks really realistic too, well done. Thanks guys, simple and atmospheric did seem like the way to go. Ebay and several smaller sellers still seem to have a few of their minis in stock (or more likely leftover).